Earlier in the spring we told you about Zently, a new app for renters that helps them pay rent on time and flag maintenance issues to their landlords. 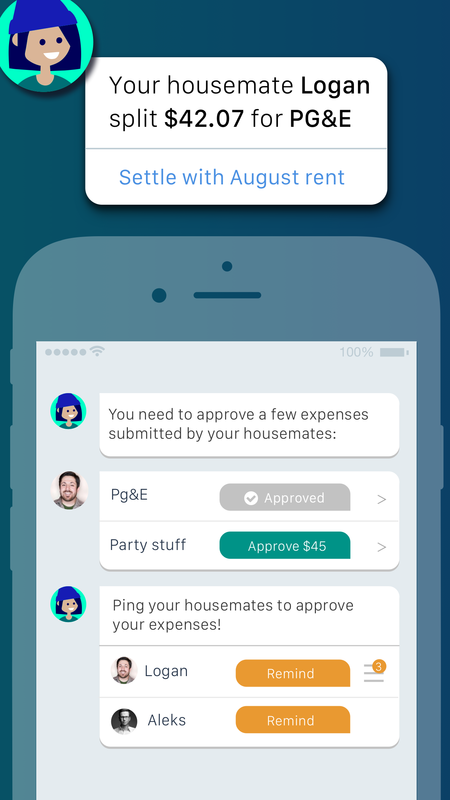 Now the app can hook into your bank account, allowing roommates to more easily split shared expenses. And the company has raised a bit of funding as it looks to grow its user base. Founded by a couple of LinkedIn alums, Zently was built on the premise of making communications between renter and landlord easier. The first use case the company identified was around getting maintenance issues fixed faster. By allowing renters to identify issues and by highlighting local service providers who can fix them, Zently was hoping to save landlords and property managers some time and hassle in their jobs. The app also was designed to simplify the rent payment process. Landlords that adopt Zently can get paid by ACH, otherwise the company sends monthly rent checks at the renters’ behest. Because the app was already handling one piece of a renter’s financial life, the folks at Zently decided to extend that out and provide more value for those who share a place with roommates. The latest update to the Zently app now allows roommates to more easily reconcile shared expenses. The new feature works by connecting with a user’s bank or credit card account and then allowing them to flag purchases that are made for the household. Once that’s done, the app takes into account multiple purchases made by each member of a household and figures out who owes what to whom. That includes the master tenant, who can now collect rent from multiple roommates in one place, as opposed to receiving multiple payments through apps like PayPal, Venmo or Square Cash. Along with the latest app update, Zently is also announcing a new round of funding. The company has raised $1.6 million led by Montage Ventures. The funding also includes some strategic money from folks in the real estate industry, according to founder Sachit Kamat. With funding in place and bill-splitting available for renters, the Zently team hopes to get more renters on board, which it believes will lead to more landlords adopting its platform.